Dr. Dale Gerber provides top-quality dental implant restoration for Alachua County. He and his team are committed to delivering results that look great and feel comfortable while functioning like healthy natural teeth. A dental implant combines a titanium post, to replace the root of a tooth, and a restoration, which is the crown or visible portion of the tooth. Implants can also support other prosthetics for multiple tooth restorations like bridges and dentures. When you visit our practice in West Gainesville for a dental implant consultation, Dr. Gerber will assess your gums and jaw to see if you are a good candidate for the procedure. If bone grafting is required due to the prolonged absence of teeth, our trusted local specialist can perform this procedure. Grafting pretreatments bolster hard tissue to ensure the proper integration of the implant post. He will then be able to insert the post into to the jaw bone. Once healing has completed, your crown or bridge can be placed by Dr. Gerber. Dental implants are strong, stable, and natural looking. There is no need to alter healthy teeth as in the case of affixing a traditional bridge. Additionally, you never have to risk the embarrassment of dentures slipping when you eat, speak, or smile again. Because dental implants can support any type of restoration you need and remain healthy, as they are not affected by decay, there is no healthier solution to replace missing teeth. What Are My Implant Restoration Options? Implant-supported Crowns permanently replace one or more individual teeth, with each crown being supported by its own implant post. 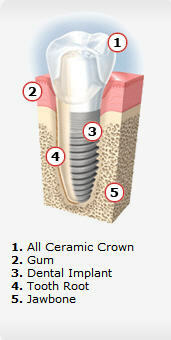 Implant-supported Bridges permanently replace a row of teeth with two or more implant posts. Implant-Supported (Hybrid) Dentures permanently replace several teeth up to a full arch with four or more posts. These can only be removed by your dentist during check-ups. Implant-Retained (Removable) Dentures replace several teeth up to a full arch with two or more implant posts. This option is more affordable and provides much more stability than traditional adhesive-based dentures and feel more natural as well. This procedure necessitates that patients wait for their jaw bone to heal, which can take a few months. Three months for patients who don’t require bone grafting, and six months for those who do, are common timelines for the healing process to finish. During this time of bone bonds with the biocompatible titanium post, providing a strong and secure foundation for your restorations. In the meantime, Dr. Gerber will affix a temporary crown or bridge and instruct you on caring for your implants as they heal. For our implant supported or retained denture patients, we generally place these the same day. Dr. Gerber is happy to be able to provide this healthy solution to replace missing teeth and is dedicated to exceeding expectations with his excellent care. We offer quality dental implant restoration for Newberry, Gainesville, and all of Alachua County. To learn more, call Gerber Dental today!